For other variants of this aircraft, see Boeing 737 Classic, Boeing 737 Next Generation, and Boeing 737 MAX. The Boeing 737 is an American short- to medium-range twinjet narrow-body airliner developed and manufactured by Boeing Commercial Airplanes. Originally developed as a shorter, lower-cost twin-engine airliner derived from the 707 and 727, the 737 has developed into a family of thirteen passenger models with capacities from 85 to 215 passengers. The 737 is Boeing's only narrow-body airliner in production, with the 737 Next Generation (-700, -800, and -900ER) and the re-engined and updated 737 MAX variants. The 737 was originally envisioned in 1964. The initial 737-100 made its first flight in April 1967, and entered airline service in February 1968 with Lufthansa. Next, the lengthened 737-200 entered service in April 1968. In the 1980s Boeing launched the longer 737-300, -400, and -500 variants (referred to as the Boeing 737 Classic series) featuring CFM56 turbofan engines and wing improvements. The Boeing 737 Next Generation (NG) was introduced in the 1990s, with a redesigned, increased wing span, upgraded "glass" cockpit, and new interior. The 737 NG comprises the 737-600, -700, -800, and -900 variants, with lengths ranging from 31.09 to 42.06 m (102 to 138 ft). Boeing Business Jet versions of the 737 NG are also produced. The 737 was revised again in the 2010s for greater efficiency, with the 737 MAX series featuring CFM LEAP-1B engines and improved winglets. The 737 MAX entered service in 2017 but, after a successful start, was grounded worldwide in March 2019 following two fatal crashes. The 737 series is the highest-selling commercial jetliner in history. The 737 has been continuously manufactured since 1967; the 10,000th was rolled out on March 13, 2018, a MAX 8 destined for Southwest Airlines, and over 4,600 orders are pending. Assembly of the 737 is performed at the Boeing Renton Factory in Renton, Washington. Many 737s serve markets previously filled by 707, 727, 757, DC-9, and MD-80/MD-90 airliners, and the aircraft currently competes primarily with the Airbus A320 family. As of 2006, there were an average of 1,250 Boeing 737s airborne at any given time, with two either departing or landing somewhere every five seconds. Initial design featured podded engines on the aft fuselage and a T-tail like the 727, and five-abreast seating, but engineer Joe Sutter instead placed the engines under the wings to lighten the structure, enabling fuselage widening for six-abreast seating. The 737 design was presented in October 1964 at the Air Transport Association maintenance and engineering conference by chief project engineer Jack Steiner, where its elaborate high-lift devices raised concerns about maintenance costs and dispatch reliability. The launch decision for the $150 million development was made by the board on February 1, 1965. On April 5, 1965, Boeing announced an order by United Airlines for 40 737s. United wanted a slightly larger airplane than the original 737, so Boeing stretched the fuselage 36 in (91 cm) ahead of, and 40 in (102 cm) behind the wing. The longer version was designated 737-200, with the original short-body aircraft becoming the 737-100. Detailed design work continued on both variants at the same time. Boeing was far behind its competitors when the 737 was launched; rival aircraft BAC-111, Douglas DC-9, and Fokker F28 were already into flight certification. To expedite development, Boeing used 60% of the structure and systems of the existing 727, the most notable being the fuselage cross-section. This fuselage permitted six-abreast seating compared to the rival BAC-111 and DC-9's five-abreast layout. Originally, the span arrangement of the airfoil sections of the 737 wing was planned to be very similar to that of the 707 and 727, but somewhat thicker. A substantial improvement in drag at high Mach numbers was achieved by altering these sections near the nacelle. The engine chosen was the Pratt & Whitney JT8D-1 low-bypass ratio turbofan engine, delivering 14,500 lbf (64 kN) thrust. With the wing-mounted engines, Boeing decided to mount the horizontal stabilizer on the fuselage rather than the T-tail style of the Boeing 727. The initial assembly of the Boeing 737 was adjacent to Boeing Field (now officially named King County International Airport) because the factory in Renton was filled to capacity with the production of the 707 and 727. After 271 of the Boeing 737 aircraft were built, production was moved to Renton in late 1970. A significant portion of fuselage assembly—previously done by Boeing in Wichita, Kansas—is now performed by Spirit AeroSystems, which purchased some of Boeing's assets in Wichita. Key to increasing production efficiencies, the entire fuselage is shipped since the 737 Next Generation while it was sent in two pieces before. The fuselage is joined with the wings and landing gear and then moves down the assembly line for the engines, avionics, and interiors. After rolling out the aircraft, Boeing tests the systems and engines before a plane's maiden flight to Boeing Field, where it is painted and fine-tuned before delivery to the customer. The first of six -100 prototypes rolled out in December 1966 and made its maiden flight on April 9, 1967, piloted by Brien Wygle and Lew Wallick. On December 15, 1967, the Federal Aviation Administration certified the 737-100 for commercial flight, issuing Type Certificate A16WE. The 737 was the first aircraft to have, as part of its initial certification, approval for Category II approaches, which refers to an precision instrument approach and landing with a decision height between 98 to 197 feet (30 to 60 m). The 737-200 had its maiden flight on August 8, 1967. It was certified by the FAA on December 21, 1967, and the inaugural flight for United was on April 28, 1968, from Chicago to Grand Rapids, Michigan. The lengthened -200 was widely preferred over the -100 by airlines. Sales were low in the early 1970s and, after a peak of 114 deliveries in 1969, only 22 737s were shipped in 1972 with 19 in backlog. The US Air Force saved the program by ordering T-43s. African airline orders kept the production running until the 1978 US Airline Deregulation Act where demand was better for a six-abreast narrow-body aircraft, particularly re-engined with the CFM56, struggling at the time. The original engine nacelles incorporated thrust reversers taken from the 727 outboard nacelles. They proved to be relatively ineffective and tended to lift the aircraft up off the runway when deployed. This reduced the downforce on the main wheels thereby reducing the effectiveness of the wheel brakes. In 1968, an improvement to the thrust reversal system was introduced. A 48-inch tailpipe extension was added and new, target-style, thrust reversers were incorporated. The thrust reverser doors were set 35 degrees away from the vertical to allow the exhaust to be deflected inboard and over the wings and outboard and under the wings. The improvement became standard on all aircraft after March 1969, and a retrofit was provided for active aircraft. Boeing fixed the drag issue by introducing new longer nacelle/wing fairings, and improved the airflow over the flaps and slats. The production line also introduced an improvement to the flap system, allowing increased use during takeoff and landing. All these changes gave the aircraft a boost to payload and range, and improved short-field performance. In May 1971, after aircraft #135, all improvements, including more powerful engines and a greater fuel capacity, were incorporated into the 737-200, giving it a 15% increase in payload and range over the original -200s. This became known as the 737-200 Advanced, which became the production standard in June 1971. In 1970, Boeing received only 37 orders. Facing financial difficulties, Boeing considered closing the 737 production-line and selling the design to Japanese aviation companies. After the cancellation of the Boeing Supersonic Transport, and scaling back of 747 production, enough funds were freed up to continue the project. In a bid to increase sales by offering a variety of options, Boeing offered a 737C (Convertible) model in both -100 and -200 lengths. This model featured a 134 in × 87 in (340 cm × 221 cm) freight door just behind the cockpit, and a strengthened floor with rollers, which allowed for palletized cargo. A 737QC (Quick Change) version with palletized seating allowed for faster configuration changes between cargo and passenger flights. With the improved short-field capabilities of the 737, Boeing offered the option on the -200 of the gravel kit, which enables this aircraft to operate on remote, unpaved runways. Until retiring its -200 fleet in 2007, Alaska Airlines used this option for some of its combi aircraft rural operations in Alaska. Northern Canadian operators Air Inuit, Air North, Canadian North, First Air and Nolinor Aviation still operate the gravel kit aircraft in Northern Canada, where gravel runways are common. In 1988, the initial production run of the -200 model ended after producing 1,114 aircraft. The last one was delivered to Xiamen Airlines on August 8, 1988. Development began in 1979 for the 737's first major revision. Boeing wanted to increase capacity and range, incorporating improvements to upgrade the aircraft to modern specifications, while also retaining commonality with previous 737 variants. In 1980, preliminary aircraft specifications of the variant, dubbed 737-300, were released at the Farnborough Airshow. Boeing engineer Mark Gregoire led a design team, which cooperated with CFM International to select, modify and deploy a new engine and nacelle that would make the 737-300 into a viable aircraft. They chose the CFM56-3B-1 high-bypass turbofan engine to power the aircraft, which yielded significant gains in fuel economy and a reduction in noise, but also posed an engineering challenge, given the low ground clearance of the 737 and the larger diameter of the engine over the original Pratt & Whitney engines. Gregoire's team and CFM solved the problem by reducing the size of the fan (which made the engine slightly less efficient than it had been forecast to be), placing the engine ahead of the wing, and by moving engine accessories to the sides of the engine pod, giving the engine a distinctive non-circular "hamster pouch" air intake. Earlier customers for the CFM56 included the U.S. Air Force with its program to re-engine KC-135 tankers. The passenger capacity of the aircraft was increased to 149 by extending the fuselage around the wing by 9 feet 5 inches (2.87 m). The wing incorporated several changes for improved aerodynamics. The wingtip was extended 9 in (23 cm), and the wingspan by 1 ft 9 in (53 cm). The leading-edge slats and trailing-edge flaps were adjusted. The tailfin was redesigned, the flight deck was improved with the optional EFIS (Electronic Flight Instrumentation System), and the passenger cabin incorporated improvements similar to those developed on the Boeing 757. The prototype −300, the 1,001st 737 built, first flew on February 24, 1984 with pilot Jim McRoberts. It and two production aircraft flew a nine-month-long certification program. In June 1986, Boeing announced the development of the 737-400, which stretched the fuselage a further 10 ft (3.0 m), increasing the passenger load to 188. The -400s first flight was on February 19, 1988, and, after a seven-month/500-hour flight-testing run, entered service with Piedmont Airlines that October. The -500 series was offered, due to customer demand, as a modern and direct replacement of the 737-200. It incorporated the improvements of the 737 Classic series, allowing longer routes with fewer passengers to be more economical than with the 737-300. The fuselage length of the -500 is 1 ft 7 in (48 cm) longer than the 737-200, accommodating up to 140 passengers. Both glass and older-style mechanical cockpits arrangements were available. Using the CFM56-3 engine also gave a 25% increase in fuel efficiency over the older -200s P&W engines. The 737-500 was launched in 1987 by Southwest Airlines, with an order for 20 aircraft, and flew for the first time on June 30, 1989. A single prototype flew 375 hours for the certification process, and on February 28, 1990, Southwest Airlines received the first delivery. The price of jet fuel reached a peak in 2008, when airlines devoted 40% of the retail price of an air ticket to pay for fuel, versus 15% in 2000. Consequently, in that year carriers retired Classic 737 series aircraft to reduce fuel consumption; replacements consisted of more efficient Next Generation 737s or Airbus A320/A319/A318 series aircraft. On June 4, 2008, United Airlines announced it would retire all 94 of its Classic 737 aircraft (64 737-300 and 30 737-500 aircraft), replacing them with Airbus A320 jets taken from its Ted subsidiary, which has been shut down. Prompted by the new Airbus A320, Boeing initiated development of an updated series of aircraft in 1991. After working with potential customers, the 737 Next Generation (NG) program was announced on November 17, 1993. The 737NG encompasses the -600, -700, -800, and -900, and is to date the most significant upgrade of the airframe. The performance of the 737NG is, in essence, that of a new aircraft, but important commonality is retained from previous 737 models. The wing was redesigned with a new airfoil section, greater chord, increased wing span by 16 ft (4.9 m) and area by 25%, which increased total fuel capacity by 30%. New, quieter, more fuel-efficient CFM56-7B engines were used. The wing, engine, and fuel capacity improvements combined increase the 737's range by 900 nautical miles (1,700 km) to over 3,000 nautical miles (5,600 km), now permitting transcontinental service. With the increased fuel capacity, higher maximum takeoff weight (MTOW) specifications are offered. The 737NG included redesigned vertical stabilizers, and winglets were available on most models. The flight deck was upgraded with modern avionics, and passenger cabin improvements similar to those on the Boeing 777, including more curved surfaces and larger overhead bins than previous-generation 737s. The Next Generation 737 interior was also adopted on the Boeing 757-300. In 2004, Boeing offered a Short Field Performance package in response to the needs of Gol Transportes Aéreos, which frequently operates from restricted airports. The enhancements improve takeoff and landing performance. The optional package is available for the 737NG models and standard equipment for the 737-900ER. The CFM56-7B Evolution nacelle began testing in August 2009 to be used on the new 737 PIP (Performance Improvement Package) due to enter service mid-2011. This new improvement is said to shave at least 1% off overall drag and have some weight benefits. Overall, it is claimed to have a 2% improvement on fuel burn on longer stages. In 2010, new interior options for the 737NG included the 787-style Boeing Sky Interior. Boeing delivered the 5,000th 737 to Southwest Airlines on February 13, 2006, the 6,000th 737 to Norwegian Air Shuttle in April 2009, the 8,000th 737 to United Airlines on April 16, 2014. The Airbus A320 family has outsold the 737NG over the past decade, although its order totals include the A321 and A318, which have also rivaled Boeing's 757 and 717, respectively. The 737NG has also outsold the A320 on an annual basis in past years, with the next generation series extending the jetliner's run as the most widely sold and commonly flown airliner family since its introduction. The 10,000th aircraft was ordered in July 2012. The 737, particularly the 737 Next Generation, has been featured in many flight simulation games, including Infinite Flight and Microsoft Flight Simulator X. Since 2006, Boeing has discussed replacing the 737 with a "clean sheet" design (internally named "Boeing Y1") that could follow the Boeing 787 Dreamliner. A decision on this replacement was postponed, and delayed into 2011. In November 2014, it was reported that Boeing plans to develop a new aircraft to replace the 737 in the 2030 time frame. The airplane is to have a similar fuselage, but probably made from composite materials similar to the Boeing 787 Dreamliner. Boeing also considers a parallel development along with the 757 replacement, similar to the development of the 757 and 767 in the 1970s. On July 20, 2011, Boeing announced plans for a new 737 version to be powered by the CFM International LEAP-X engine, with American Airlines intending to order 100 of these aircraft. On August 30, 2011, Boeing confirmed the launch of the 737 new engine variant, called the 737 MAX, with new CFM International LEAP-1B engines. On September 23, 2015, Boeing announced a collaboration with Commercial Aircraft Corporation of China Ltd. to build a completion and delivery facility for the 737 in China, the first outside the U.S. This facility initially handles interior finishing only, but will subsequently be expanded to include paintwork. The first 737 MAX was delivered from the facility to Air China on December 15, 2018. As the 737's fuselage design is derived from that of the Boeing 707, it inherited the distinctive 'eyebrow windows' used on the larger airliner, situated just above the windscreen. 737s are not equipped with fuel dump systems. The original aircraft were too small to require them, and adding a fuel dump system to the later, larger variants would have incurred a large weight penalty. Boeing instead demonstrated an "equivalent level of safety". Depending upon the nature of the emergency, 737s either circle to burn off fuel or land overweight. If the latter is the case, the aircraft is inspected by maintenance personnel for damage and then returned to service if none is found. The wing also incorporated changes for improved aerodynamics. The engines' accessory gearbox was moved from the 6 o'clock position under the engine to the 4 o'clock position (from a front/forward looking aft perspective). This side-mounted gearbox gives the engine a somewhat triangular rounded shape. Because the engine is close to the ground, 737-300s and later models are more prone to engine foreign object damage (FOD). The improved CFM56-7 turbofan engine on the 737 Next Generation is 7% more fuel-efficient than the previous CFM56-3 in the 737 classics. The newest 737 variants, the 737 MAX family, are to feature CFM International LEAP-1B engines with a 68 inches (1.73 m) fan diameter. These engines are expected to be 10-12% more efficient than the CFM56-7B engines on the 737 Next Generation family. The primary flight controls are intrinsically safe. In the event of total hydraulic system failure or double engine failure, they will automatically and seamlessly revert to control via servo tab. In this mode, the servo tabs aerodynamically control the elevators and ailerons; these servo tabs are in turn controlled by cables running to the control yoke. The pilot's muscle forces alone control the tabs. For the 737 Next Generation, a six-screen LCD glass cockpit with modern avionics was implemented while retaining crew commonality with previous generation 737. Most 737 cockpits were delivered with "eyebrow windows" positioned above the main glareshield, which were a feature of the original 707 and 727 to allow for better crew visibility. Contrary to popular belief, these windows were not intended for celestial navigation (only the military T-43A had a sextant port for star navigation, which the civilian models lacked). With modern avionics, the windows became redundant, and many pilots actually placed newspapers or other objects in them to block out sun glare. They were eliminated from the 737 cockpit design in 2004, although they are still installed on customer request. The eyebrow windows are sometimes removed and plugged, usually during maintenance overhauls, and can be distinguished by the metal plug which differs from the smooth metal in later aircraft that were not originally fitted with the windows. Split Scimitar winglets became available in 2014 for the 737-800, 737-900ER, BBJ2 and BBJ3, and in 2015 for the 737-700, 737-900 and BBJ1. Split Scimitar winglets were developed by Aviation Partners Inc. (API), the same Seattle based corporation that developed the blended winglets; the Split Scimitar winglets produce up to a 5.5% fuel savings per aircraft compared to 3.3% savings for the blended winglets. Southwest Airlines flew their first flight of a 737-800 with Split Scimitar winglets on April 14, 2014. The next generation 737, 737 MAX, will feature an Advanced Technology (AT) Winglet that is produced by Boeing. The Boeing AT Winglet resembles a cross between the Blended Winglet and the Split Scimitar Winglet. As of July 2008[update] the 737 features carbon brakes manufactured by Messier-Bugatti. These new brakes, now certified by the Federal Aviation Administration, weigh 550–700 lb (250–320 kg) less than the steel brakes normally fitted to the Next-Gen 737s (weight savings depend on whether standard or high-capacity brakes are fitted). A weight reduction of 700 pounds on a Boeing 737-800 results in 0.5% reduction in fuel burn. A short-field design package is available for the 737-600, -700, and -800, allowing operators to fly increased payload to and from airports with runways under 5,000 feet (1,500 m). The package consists of sealed leading edge slats (improved lift), a two-position tail skid (enabling greater protection against tail strikes that may be caused by the lower landing speeds), and increased flight spoiler deflection on the ground. These improvements are standard on the 737-900ER. The 737 interior arrangement has changed in successive generations. The original 737 interior was restyled for the 737 Classic models using 757 designs, while 777 architecture was used for the debut of the Next Generation 737. Designed using Boeing's new cabin concepts, the latest Sky Interior features sculpted sidewalls and redesigned window housings, along with increased headroom and LED mood lighting. Larger pivot-bins similar to those on the 777 and 787 have more luggage space than prior designs. The Sky Interior is also designed to improve cabin noise levels by 2–4 dB. The first 737 equipped with the Boeing Sky Interior was delivered to Flydubai in late 2010. Continental Airlines,Alaska Airlines, Malaysia Airlines, and TUIFly have also received Sky Interior-equipped 737s. The initial model was the 737-100. It was launched in February 1965. The -100 was rolled out on January 17, 1967, had its first flight on April 9, 1967 and entered service with Lufthansa in February 1968. The aircraft is the smallest variant of the 737. A total of 30 737-100s were ordered and delivered; the final commercial delivery took place on October 31, 1969 to Malaysia–Singapore Airlines. No 737-100s remain in commercial service. The original Boeing prototype, last operated by NASA and retired more than 30 years after its maiden flight, is on exhibit in the Museum of Flight in Seattle. The 737-200 is a 737-100 with an extended fuselage, launched by an order from United Airlines in 1965. The -200 was rolled out on June 29, 1967, and entered service with United in April 1968. The 737-200 Advanced is an improved version of the -200, introduced into service by All Nippon Airways on May 20, 1971. The -200 Advanced has improved aerodynamics, automatic wheel brakes, more powerful engines, more fuel capacity, and longer range than the -100. 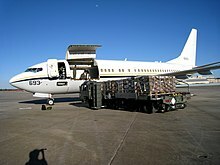 Boeing also provided the 737-200C (Cargo), which allowed for conversion between passenger and cargo use and the 737-200QC (Quick Change), which facilitated a rapid conversion between roles. The 1,095th and last delivery of a -200 series aircraft was in August 1988 to Xiamen Airlines. With a gravel kit modification the 737-200 can use unimproved or unpaved landing strips, such as gravel runways, that other similarly-sized jet aircraft cannot. Gravel-kitted 737-200 Combis are currently used by Canadian North, First Air, Air Inuit, Nolinor and Air North in northern Canada. For many years, Alaska Airlines made use of gravel-kitted 737-200s to serve Alaska's many unimproved runways across the state. Nineteen 737-200s, designated T-43, were used to train aircraft navigators for the U.S. Air Force. Some were modified into CT-43s, which are used to transport passengers, and one was modified as the NT-43A Radar Test Bed. The first was delivered on July 31, 1973 and the last on July 19, 1974. The Indonesian Air Force ordered three modified 737-200s, designated Boeing 737-2x9 Surveiller. They were used as Maritime reconnaissance (MPA)/transport aircraft, fitted with SLAMMAR (Side-looking Multi-mission Airborne Radar). The aircraft were delivered between May 1982 and October 1983. Many 737-200s have been phased out or replaced by newer 737 versions. After 40 years, in March 2008, the final 737-200 aircraft in the U.S. flying scheduled passenger service were phased out, with the last flights of Aloha Airlines. The variant still sees regular service through North American charter operators such as Sierra Pacific. By the early 1990s, it became clear that the new Airbus A320 was a serious threat to Boeing's market share, as Airbus won previously loyal 737 customers such as Lufthansa and United Airlines. In November 1993, Boeing's board of directors authorized the Next Generation program to replace the 737 Classic series. The -600, -700, -800, and -900 series were planned. After engineering trade studies and discussions with major 737 customers, Boeing proceeded to launch the 737 Next Generation series in late 1993, with 6,996 built as of January 2019[update]. Variants include the P-8 Poseidon. The Boeing 737 MAX is the fourth generation of the 737, succeeding the Boeing 737 Next Generation (NG). After Airbus launched the Airbus A320neo family in December 2010, achieving 1,029 orders by June 2011 and breaking Boeing's monopoly with American Airlines with an order for 130 A320neos that July, Boeing launched the 737 MAX program on August 30, 2011. The first flight was on January 29, 2016. It gained FAA certification on March 8, 2017. The first delivery was a MAX -8 on May 6, 2017 to Malindo Air, which put it into service on May 22, 2017. The 737 MAX is based on earlier 737 designs. The MAX is re-engined with more efficient CFM International LEAP-1B powerplants, aerodynamic improvements (most notably split-tip winglets), and airframe modifications. The 737 MAX series is offered in four lengths, typically offering 138 to 230 seats and a 3,215 to 3,825 nmi (5,954 to 7,084 km) range. The 737 MAX 7, MAX 8, and MAX 9 replace, respectively, the 737-700, -800, and -900. Additional length is offered with the further stretched 737 MAX 10. As of January 2019[update], the Boeing 737 MAX has received 5,011 firm orders. In March 2019, the 737 MAX was grounded worldwide after two fatal crashes within a five–month period. Boeing's BBJ3 is based on the 737-900ER. The BBJ3 has 1,120 square feet (104 m2) of floor space, 35% more interior space, and 89% more luggage space than the BBJ2. It has an auxiliary fuel system, giving it a range of up to 4,725 nautical miles (8,751 km), and a Head-up display. Boeing completed the first example in August 2008. This aircraft's cabin is pressurized to a simulated 6,500-foot (2,000 m) altitude. Boeing is studying plans to offer passenger to freighter conversion for the 737-800. Boeing has signed an agreement with Chinese YTO Airlines to provide the airline with 737-800 Boeing Converted Freighters (BCFs) pending a planned program launch. In 2016, Boeing officially launched the 737-800BCF program, converting old passenger jets to dedicated freighters. The first aircraft was delivered in 2018 to GECAS, which is leased to West Atlantic. The Boeing 737 Classics and the Boeing 737 Next Generation have faced main challenges from the Airbus A320 family introduced in 1988, which was developed to compete also with the McDonnell Douglas MD-80/90 series and the Boeing 717 (formerly named McDonnell Douglas MD-95). As of October 2015[update], a total of 368 aviation accidents and incidents involving all 737 aircraft had occurred, including 184 hull loss accidents resulting in a total of 4,862 fatalities. 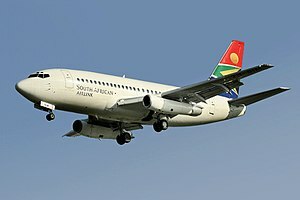 The 737 has also been in 111 hijackings involving 325 fatalities. 19437/1: 737-130 registered N515NA on static display at the Museum of Flight in Seattle, Washington. It was the first 737 built and is painted in NASA markings. 19047/14: 737-222 registered N9009U preserved by Southern Illinois University Carbondale at Southern Illinois Airport. 20213/160: 737-201 registered N213US forward fuselage on static display at the Museum of Flight in Seattle, Washington in USAir livery. 20561/292: 737-281 registered LV-WTX on static display at the National Museum of Aeronautics in Morón, Buenos Aires. 21262/470: 737-2H4 registered C-GWJT on static display at the British Columbia Institute of Technology Aerospace Technology Campus in Richmond, British Columbia. It is used for ground instructional training. The aircraft was donated by WestJet and bears its livery. 21340/499: 737-2H4 registered N29SW on static display at the Kansas Aviation Museum in Wichita, Kansas. It was formerly operated by Ryan International Airlines and prior to that Southwest Airlines. 21712/557: 737-275 registered C-GIPW preserved in operational condition at Alberta Flying Heritage Museum in Villeneuve, Alberta. Painted in Pacific Western Airlines livery. 22578/767: 737-290C registered N740AS on static display at the Alaska Aviation Heritage Museum in Anchorage, Alaska. It was formerly operated by Alaska Airlines. 22826/878: 737-2H4 registered YV1361 preserved at a hotel in Santiago, Chile. It was formerly operated by Avior Airlines. 23059/980: 737-2Z6 registered 22-222 on static display at the Royal Thai Air Force Museum in Bangkok. 22940/1037: 737-3H4 registered N300SW on static display at the Frontiers of Flight Museum in Dallas, Texas. It was the first such aircraft delivered to Southwest Airlines in November 1984. 23257/1124: 737-301 registered PK-AWU on static display at ITE College Central in Singapore. 23472/1194: 737-219 registered ZS-SMD on static display at the South African Airways Museum in Germiston, Gauteng. 27286/2528: 737-3Q8 registered N759BA on static display at the Pima Air & Space Museum in Tucson, Arizona. It is painted in China Southern Airlines markings, and was previously operated by the airline as B-2921. ^ a b c d e f g h i "Boeing 737 Model Summary – Orders and Deliveries". Boeing.com. Boeing. January 2019. Retrieved February 23, 2019. ^ a b "737 price raised". Aviation Week. January 22, 1968. p. 31. ^ a b Kingsley-Jones, Max. "6,000 and counting for Boeing's popular little twinjet." Flight International, Reed Business Information, April 22, 2009. Retrieved: April 22, 2009. ^ a b Max Kingsley-Jones (March 13, 2018). "How Boeing built 10,000 737s". Flightglobal. ^ a b "Airbus A320 Aircraft Facts, Dates and History." Archived January 19, 2013, at the Wayback Machine Archived January 19, 2013, at the Wayback Machine Flightlevel350.com. Retrieved: May 12, 2010. ^ a b c "The 737 Story: Little Wonder." flightglobal.com. February 7, 2006. Retrieved: January 7, 2008. ^ a b c d Stephen Trimble (April 7, 2017). "Half-century milestone marks 737's enduring appeal". FlightGlobal. ^ a b c Wallace, J. "Boeing delivers its 5,000th 737." Seattle Post-Intelligencer, February 13, 2006. Retrieved June 7, 2011. ^ Gates, Dominic. "Successor to Boeing 737 likely to be built in state." Seattle Times, December 30, 2005. Retrieved: February 10, 2008. ^ John W. McCurry. "Spirit of Expansion". siteselection.com. Site Selection Online. Retrieved November 22, 2014. ^ Jon Ostrower (August 12, 2013). "Spirit AeroSystems CEO Says Boeing Exploring Increasing 737 Production". The Wall Street Journal. Retrieved November 22, 2014. (Subscription required (help)). ^ Guy Norris (February 20, 2018). "Spirit of '67: How Boeing's 'Baby' Jetliner Fuselage Made Its Journey West". Aviation Week & Space Technology. ^ "Original 737 Comes Home to Celebrate 30th Anniversary". www.boeing.com. Boeing. May 2, 1997. Retrieved November 18, 2014. ^ a b "Type Certificate Data Sheet A16WE." faa.gov. Retrieved: September 3, 2010. ^ Williams, Scott. "CAT II – Category II – Approach". Aviation Glossary. Retrieved October 30, 2018. ^ "Boeing 737 History". ModernAirlines.com. Retrieved August 10, 2015. ^ Sharpe, Shaw, Mike, Robbie (2001). Boeing 737-100 and 200. MBI Publishing Company. ISBN 9780760309919. Retrieved August 10, 2015. ^ "Powerplant - Reverse Thrust." b737.org.uk. Retrieved: November 1, 2011. ^ "737 Airplane Characteristics for Airport Planning" (PDF). Boeing. May 2011. Retrieved February 7, 2015. ^ "Unpaved Strip Kit." b737.org.uk. Retrieved: February 10, 2008. ^ Boeing 737-2T2C/Adv "Boeing 737." airliners.net. Retrieved: February 10, 2008. ^ Carey, Susan (April 13, 2007). "Arctic Eagles Bid Mud Hens Farewell At Alaska Airlines". Wall Street Journal. Retrieved February 7, 2015. ^ "737 Family." Boeing.com, January 5, 2008. Retrieved: April 12, 2008. ^ a b Brady, Chris. "History & Development of the Boeing 737 - Classics." The Boeing 737 Information Site, 1999. Retrieved: September 5, 2010. ^ "Boeing: Boeing 737 Facts". Boeing. September 6, 2013. Retrieved February 7, 2015. ^ "To Save Fuel, Airlines Find No Speck Too Small." The New York Times, June 11, 2008. ^ "Jet Fuel Price Development". IATA. Retrieved April 10, 2015. ^ David Grossman (June 29, 2000). "Why Ted's demise is a boost for business travelers". usatoday30.usatoday.com. USA Today. Retrieved November 19, 2014. ^ a b "About the 737 Family." The Boeing Company. Retrieved: December 20, 2007. ^ "About the 737 Family". www.boeing.com. Boeing. Retrieved November 18, 2014. ^ "Aero 17 - Blended Winglets". Boeing. 2009. Retrieved February 7, 2015. ^ Birtles 2001, pp. 28–29. ^ Norris & Wagner 1999, pp. 101–02. ^ a b c d e Kingsley-Jones, Max. "Narrow margins: Airbus and Boeing face pressue with the A-320 and 737." flightglobal.com, October 27, 2009. Retrieved: June 23, 2010. ^ "Boeing's 737 Turns 8,000: The Best-Selling Plane Ever Isn't Slowing". Bloomberg Business Week. April 16, 2014. ^ "Airbus A320 Family passes the 5,000th order mark". Airbus. January 25, 2007. Retrieved November 22, 2014. ^ "Airbus orders and deliveries." Archived September 7, 2009, at the Wayback Machine Airbus. Retrieved: September 3, 2010. ^ Gorman, Brian. "Boeing's Continuing Climb." Motley Fool., February 1, 2007. Retrieved: May 12, 2010. ^ Cochennec, Yonn. "What goes up." Archived July 8, 2012, at Archive.today Interavia Business & Technology, February 2003. Retrieved: May 12, 2010. ^ Sutton, Oliver. "Any advance on ten percent?" Archived July 8, 2012, at Archive.today Interavia Business & Technology, February 2001. Retrieved: May 12, 2010. ^ O'Sullivan, Matt. "Boeing shelves plans for 737 replacement." The Sydney Morning Herald, January 2, 2009. Retrieved: April 22, 2010. Quote: Boeing will stick with the 737, the world's most widely flown aircraft. ^ Layne, Rachel. "Bombardier's Win May Prod Airbus, Boeing to Upgrade Engines." BusinessWeek, February 26, 2010. Retrieved: April 22, 2010. ^ Jiang, Steven. "Jetset: 'Tianjin Takes Off'." The Beijinger. Retrieved: April 22, 2010. Quote: A320, the workhorse of many airlines and the second best-selling jetliner family of all time (after Boeing's venerable B737). ^ "737 tops 10,000 orders" Boeing.com, July 12, 2012. Retrieved: July 20, 2012. ^ Anselmo, Joe (March 2, 2015). "Analysts Flag Potential Airliner Glut". Aviation Week & Space Technology. Archived from the original on March 4, 2015. Retrieved March 4, 2015. ^ "Boeing: Next-Generation 737". www.boeing.com. ^ "Boeing plans to develop new airplane to replace 737 Max by 2030". Chicago Tribune, November 5, 2014. ^ Guy Norris and Jens Flottau (December 12, 2014). "Boeing Revisits Past In Hunt For 737/757 Successors". Aviation Week & Space Technology. Archived from the original on December 14, 2014. Retrieved December 14, 2014. ^ "Boeing and American Airlines Agree on Order for up to 300 Airplanes". Boeing, July 20, 2011. Retrieved: November 1, 2011. ^ "Boeing Launches 737 New Engine Family with Commitments for 496 Airplanes from Five Airlines." boeing.mediaroom.com, August 30, 2011. ^ "Boeing officially launches re-engined 737." flightglobal.com, August 30, 2011. ^ Guy Norris (August 30, 2011). "Boeing Board Gives Go-Ahead To Re-Engined 737". aviationweek.com. Aviation Week. ^ Thompson, Loren. "Boeing To Build Its First Offshore Plane Factory In China As Ex-Im Bank Withers". Retrieved September 23, 2015. ^ "PICTURES: Boeing delivers first China-completed 737 Max". Flightglobal.com. December 15, 2018. Retrieved December 17, 2018. ^ Dekkers, Daniel, et al. (Project 2A2H). [home.deds.nl/~hink07/Report.pdf "Analysis Landing Gear 737-500. "][dead link] Hogeschool van Amsterdam. Aviation Studies. October 2008. Retrieved: August 20, 2011. ^ "Boeing Commercial Aircraft - In-Flight Fuel Jettison Capability" (PDF). Boeing. Retrieved November 23, 2014. ^ Cheung, Humphrey. "Troubled American Airlines jet lands safely at LAX." tgdaily.com, September 2, 2008. Retrieved: August 20, 2011. ^ Ostrower, Jon (August 30, 2011). "Boeing designates 737 MAX family". Air Transport Intelligence. Archived from the original on September 25, 2011. Retrieved September 5, 2011. ^ "Boeing's MAX, Southwest's 737". theflyingengineer. Retrieved August 27, 2015. ^ "COCKPIT WINDOWS Next-Generation 737, Classic 737, 727, 707 Airplanes" (PDF). PPG Aerospace Transparencies. Retrieved August 27, 2015. ^ "Boeing Next-Generation 737 Gets a Face-Lift". Boeing Media Room. Boeing. Retrieved March 25, 2018. ^ Wallace, James. "Aerospace Notebook: New Boeing 717 design is bound to lift quite a few eyebrows". seattlepi.com. Hearst Seattle Media, LLC. Retrieved March 25, 2018. ^ Sharpe, Michael; Shaw, Robbie (2001). Boeing 737-100 and 200. MBI Publishing Company. ISBN 9780760309919. Retrieved March 25, 2018. ^ a b c d Chris Brady (October 2014). The Boeing 737 Technical Guide. pp. 144–145. ISBN 9781291773187. ^ "Split Scimitar Schedules". aviationpartnersboeing.com. Retrieved May 29, 2015. ^ "Southwest flies first 737 with new 'split scimitar' winglets". Retrieved May 29, 2015. ^ "Design, Analysis and Multi-Objective Constrained Optimization of Multi-Winglets" (PDF). Florida International University. Retrieved August 27, 2015. ^ Wilhelm, Steve. "Mindful of rivals, Boeing keeps tinkering with its 737." Puget Sound Business Journal, August 8, 2008. Retrieved: January 21, 2011. ^ "Boeing Delivers First 737 with Enhanced Short Runway Package to GOL". Boeing. July 31, 2006. Retrieved November 21, 2014. ^ a b "Check Out Boeing's Swanky New High-Tech Interior." businessinsider.com. Retrieved: November 1, 2011. ^ "Continental first North American carrier to offer Boeing's new Sky Interior". Flightglobal. December 29, 2010. Retrieved November 22, 2014. ^ Airlines, Alaska. "Boeing 737-800 Aircraft Information | Alaska Airlines". Alaska Airlines. Retrieved June 21, 2018. ^ "MAS takes delivery of first 737-800 with Sky Interior". Flightglobal.com. November 1, 2010. Retrieved April 29, 2013. ^ "Wolkenlos in Seattle – an Bord des neuen Jets von TUIfly." podcastexperten, March 7, 2011. Retrieved: May 12, 2011. ^ "The Airplane That Never Sleeps". Boeing. July 15, 2002. Retrieved November 19, 2014. ^ "Southwest Airlines Retires Last of Founding Aircraft; Employees Help Celebrate the Boeing 737-200's Final Flight". swamedia.com. Archived from the original on September 4, 2015. Retrieved August 27, 2015. ^ a b c "World Airline Census 2018". Flightglobal.com. Retrieved August 21, 2018. ^ "Next Generation 737 Program Milestones." The Boeing Company. Retrieved: January 22, 2008. ^ "Boeing Launches 737 New Engine Family with Commitments for 496 Airplanes from Five Airlines". Boeing. August 30, 2011. ^ "Boeing's 737 MAX takes wing with new engines, high hopes". The Seattle Times. January 29, 2016. ^ "Type Certificate Data Sheet No. A16WE" (PDF). FAA. March 8, 2017. ^ Stephen Trimble (May 16, 2017). "Boeing delivers first 737 Max". Flightglobal. ^ Hashim Firdaus (May 22, 2017). "Malindo operates world's first 737 Max flight". FlightGlobal. ^ Doherty, Tucker; Lindeman, Todd. "The problems that led to the Boeing 737 MAX grounding". POLITICO. Retrieved 2019-03-17. ^ a b "The Boeing 737-700/800 BBJ/BBJ2." airliners.net. Retrieved: February 3, 2008. ^ "Boeing Business Jets Launches New Family Member". Boeing. October 16, 2006. Retrieved November 22, 2014. ^ "Boeing Completes First BBJ 3". www.wingsmagazine.com. Wings. August 14, 2008. Retrieved November 22, 2014. ^ "Boeing launches 737-800BCF programme". Flightglobal.com. February 24, 2016. Retrieved April 30, 2018. ^ "Boeing delivers first 737-800BCF to West Atlantic". Flightglobal.com. April 20, 2018. Retrieved April 30, 2018. ^ "Boeing 737 Facts". boeing.com. Boeing. Retrieved November 18, 2014. ^ "Boeing looks to sell more 737-based military jets". SeattlePi. June 9, 2011. Retrieved August 27, 2015. ^ "Orders and Deliveries search page". Boeing. September 30, 2017. Retrieved October 6, 2017. ^ "Orders and deliveries". Airbus. Retrieved 2019-02-23. ^ "DOC 8643 - Aircraft Type Designators". ICAO Publications. International Civil Aviation Organization. November 22, 2014. Retrieved June 27, 2017. ^ "Boeing Conducts Successful First Flight of Australia's 737 Airborne Early Warning & Control Aircraft". Boeing.mediaroom.com. May 20, 2004. Retrieved June 27, 2017. ^ "P-8A Poseidon" (PDF). Boeing.mediaroom.com. May 31, 2015. ^ "Boeing Completes Successful 737 MAX First Flight". Boeing.mediaroom.com. January 29, 2016. Retrieved February 6, 2016. ^ "Boeing 737 incident occurrences." Aviation-Safety.net, November 20, 2013. Retrieved: November 17, 2014. ^ "Boeing 737 Accident summary." Aviation-Safety.net. November 20, 2013. Retrieved: November 17, 2014. ^ "Boeing 737 Accident Statistics." Aviation-Safety.net, November 20, 2013. Retrieved: November 21, 2013. ^ "Statistical Summary of Commercial Jet Airplane Accidents – Accident Rates by Airplane Type" (PDF). boeing.com. Boeing. August 2014. p. 19. ^ "Boeing 737-130". The Museum of Flight. The Museum of Flight. Retrieved March 24, 2017. ^ "N9009U United Airlines Boeing 737-200". Planespotters.net. Retrieved July 11, 2018. ^ "N213US USAir Boeing 737-200". Planespotters.net. Retrieved July 11, 2018. ^ "Airframe Dossier - Boeing 737-281, c/n 20561, c/r LV-WTX". Aerial Visuals. AerialVisuals.ca. Retrieved March 24, 2017. ^ "CC-CSK Aerolineas Del Sureste Boeing 737-200". Planespotters.net. Retrieved July 11, 2018. ^ "Trasladaron el Boeing 737-200 al motel en Concón (Actualizado con fotos)". ModoCharlie. Retrieved July 11, 2018. ^ "WestJet donates 737-200 aircraft to BCIT Aerospace". BCIT. October 1, 2003. Archived from the original on July 3, 2004. Retrieved March 24, 2017. ^ "C-GWJT WestJet Boeing 737-200 - cn 21262 / 470". Planespotters.net. Planespotters.net. Retrieved March 24, 2017. ^ "Boeing 737-200". Kansas Aviation Museum. Retrieved March 24, 2017. ^ "N29SW Ryan International Airlines Boeing 737-200 - cn 21340 / 499". Planespotters.net. Planespotters.net. Retrieved March 24, 2017. ^ "C-GIPW Air Canada Tango Boeing 737-200". Planespotters.net. Retrieved July 11, 2018. ^ "N740AS Alaska Airlines Boeing 737-200 - cn 22578 / 767". Planespotters.net. Planespotters.net. Archived from the original on March 24, 2017. Retrieved March 24, 2017. ^ "Boeing 737-2H4/Adv - Avior Airlines". Airliners.net. Retrieved July 11, 2018. ^ "ROYAL THAI AIR FORCE MUSEUM, DON MUEANG" (PDF). December 26, 2016. Retrieved March 24, 2017. ^ "60201 Royal Thai Air Force Boeing 737-200 - cn 23059 / 980". Planespotters.net. Planespotters.net. Retrieved March 24, 2017. ^ "Boeing 737-300". Frontiers of Flight Museum. Frontiers of Flight Museum. Retrieved March 24, 2017. ^ "Boeing 737-301 - Institute of Technical Education - ITE". March 6, 2013. Retrieved March 20, 2013. ^ "Civilian Aviation • Home to the Civil Aviation Enthusiast • View topic - G-CELS Boeing 737-300". www.civilianaviation.co.uk. Retrieved March 17, 2018. ^ "737 MAX". Boeing. Technical Specs. ^ "737 MAX Airport Compatibility Brochure" (PDF). Boeing. June 2017. ^ a b c Butterworth-Heinemann (2001). "Civil jet aircraft design". Elsevier. Boeing Aircraft. ^ a b c "Type Certificate Data Sheet No. A16WE" (PDF). FAA. February 15, 2018. ^ "737 MAX Airplane Characteristics for Airport Planning" (PDF). Boeing. August 2017. ^ a b Gerard Frawley. "Boeing 737-100/200 Technical data & specifications". The International Directory of Civil Aircraft. ^ "Boeing revises "obsolete" performance assumptions". Flight Global. August 3, 2015. Anderson, David F.; Eberhardt, Scott (2009). Understanding Flight. Chicago: McGraw Hill Professional. ISBN 978-0-07-162696-5.